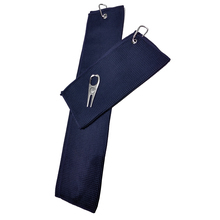 The Microfiber Tri-Fold 16” x 24” Golf Towel is ultra-absorbent and is an excellent choice for cleaning golf grips, balls and clubs. 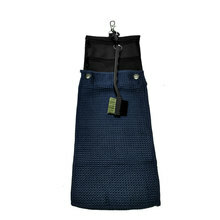 Each towel includes a heavy duty carabineer to attach to any golf bag. Available in Black, Navy Blue or Grey. I don't play golf more than once a year and I use the word "play" loosely here - mostly I drive the cart, curse like a heathen and listen to my husband laugh at me when I fling his own clubs at him by the 4th hole. However, I do ride and work with horses daily and that involves lots of sweat and dust. I am using this towel in that environment and I really like it. The carabineer attaches easily to my saddle ring and the towel weighs essentially nothing so I can have it on hand no matter where I am. The waffle weave seems like it would be a little rough on the face, but it really is soft and very absorbent. Plus the blue is a rich, deep true navy that looks great with my grey stallion and his blue trimmed saddle pad. This is the single towel offering by CaddyDaddy. They actually offer a set of two towels and divot, which is a little better value (see below). This is a “microfiber “towel with a waffle weave. I’ve always found microfiber to be a bit “scratchy”, but I like the way they work. 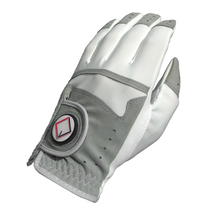 They wash well, and you really want to wash all microfiber separately. If you mix with cotton, for example, then the microfiber will pick-up all the loose cotton threads.